In addition to the release of Immortal Treasure III, Valve have also announced the broadcast talent that will be present at The International 2018 via an update to the in-game compendium. Headlining the talent are hosts Paul "ReDeYe" Chaloner, Jorien "Sheever" van der Heijden, Alex "Machine" Richardson, and William "Chobra" Cho. AdministratorIn those days, spirits were brave, the stakes were high, men were real men, women were real women, and small furry creatures from Alpha Centauri were real small furry creatures from Alpha Centauri. Wow no LD? But on the other hand that's so awesome that Grandgrant has finally made it! This looks like the best lineup I think so far for a TI. All great picks CAN'T WAIT!!! LD is focused on the business side of BTS now, he's done very few casts in Dota for the past year. Lumi better stay away from commentary. Is this the first TI without a real broadcast talent snub? It seems like every year there's one or two people who aren't invited who "should" be. 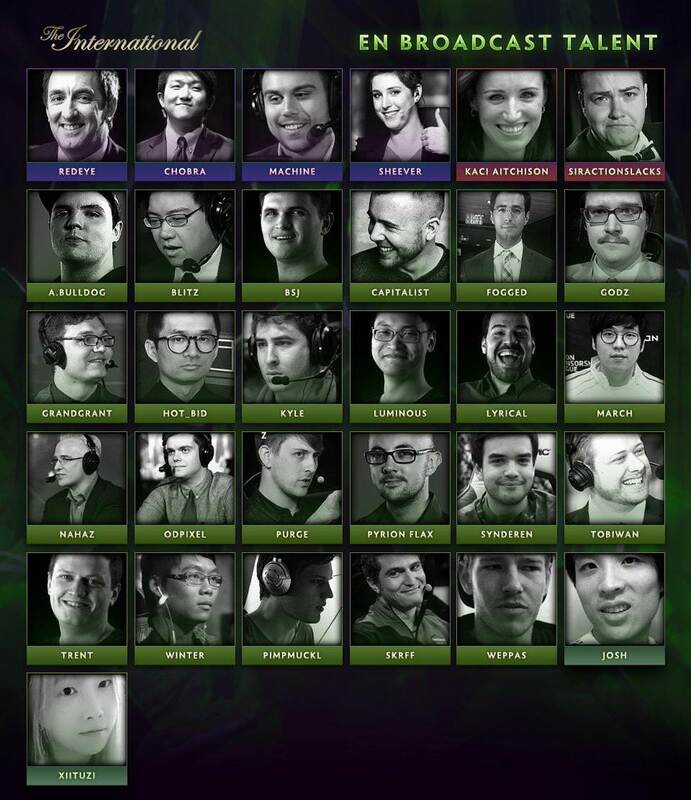 Speaking of which, have we had a trio cast on any TI finals? If Synderen and Tobi dont get the grand finals I am watching the Chinese cast. Awesome talent roster. So many names wow. Excited to see Chobra back, along with some well deserved Grant and BSJ, Hot_Bid's going to be on camera? Panelist? Even RU has some bigwigs going. Wonder how Lil will fare on panel. There is not better duo than Tobi + Synderen. Period. OD + Fogged are close, others - meh. Agree with March being a surprise. Interesting to see how he does. Also excited about March. Hope he gets an awkward segment with Kaci. Thank you for posting this. My literal first thought was "wow no Kotlguy." Eased my mind.